This unexpected kit has two books and one video download for a total of 41 afghan patterns and tons of crochet stitches and techniques. Cozy up this season with the Unexpected Crochet Afghan Kit full of patterns, stitches, and crochet techniques perfect for hooking a beautiful afghan! This Kit includes 2 Books, 1 Video Workshop, and 41 Crochet Afghan patterns! Hurry! We have a limited supply of Kits. Order your kit today. Enjoy crochet techniques for cables, motifs, colorwork, crocheted lace, and even Tunisian crochet. Join crochet expert and designer Robyn Chachula on this crochet workshop video as she walks you through the basic crochet stitches that are popular for crocheting afghans. You'll begin with an overview of fiber behavior, gauge, and how to read crochet symbols. Then, dive into the nuts and bolts of creating beautiful pieces for your friends, family, and your own home. Crochet techniques include colorwork, cables, post stitches, Tunisian crochet, lace, and the popular Granny Square motifs. Plus, included with this workshop is a mini stitch dictionary and two afghan patterns. 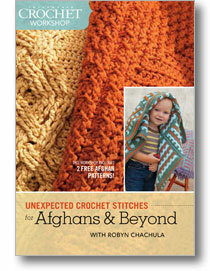 10 fun and easy afghans at your fingertips! 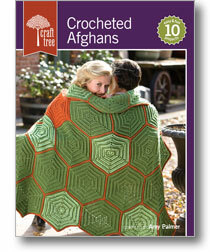 Craft Tree: Crocheted Afghans features a charming collection of 10 popular afghans, blankets, and throws from top designers. Explore a variety of shapes and motifs from hexagons and stripes to cables and mosaics from top designers. Each pattern showcases a different design and personality, from adventurous to traditional, making these the perfect projects to keep or give. Grab your needle and get started on one of these fun, easy, and cozy projects. This kit is available with print books and a DVD, or instantly downloads this kit with eBooks and video download. Either way, your access to 41 crochet afghan patterns and an abundance of crochet tips and techniques for afghans is just a click away. 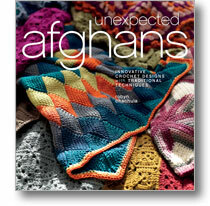 Order your Unexpected Crochet Afghan Kit today!